Serve your guests your own personal coffee culture � they�ll enjoy it! Melitta is a German company, founded in 1908, that offers everything you need to make a great tasting cup of coffee for you and your guests. 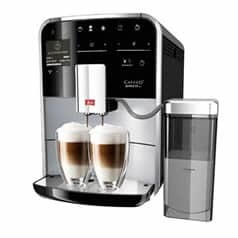 Choose from a selection of bean to cup coffee machines or filter machines, buy accessories like filters and even cafetieres, and create a cup of coffee exactly the way you want it. Once you have determined whether you want a bean to cup machine or a filter coffee machine, you will need to choose the most appropriate size of machine to cater for the number of people that you normally brew up for. You can also choose from a selection of colours, which is especially beneficial because we tend to use coffee machines multiple times over the space of a day so it would be inconvenient to have to keep putting the machine away after every use. FREE TRAVEL MUG AND 1KG COFFEE BEANS! The founder of the Melitta brand is credited with having created the first ever filter coffee machine, showing the pedigree that the German manufacturer has, and at ECookShop we have a large selection of the products and ranges that they manufacture. We always ensure that our prices are competitive and regularly run discounts and sales even on the biggest names that we sell. You can call any of our team to ask questions about the specific items that we sell on ECookShop. Alternatively, you can call in to Dawson's Department Store where you will be able to look at every homeware and gardenware item that we sell. Or, if you see the coffee machine you want on the website, you can order using our secure online ordering system and, if you spend more than �50, you can have your order delivered straight to your UK address completely free of charge. Shop now and transform the way you make coffee. Tea might be considered our national drink, but we have rapidly become a nation of coffee lovers. While instant coffee was once the dominant force behind the market, the prevalence of high quality brews from major coffee shops, combined with the improved affordability of products like coffee machines and the consumables that are needed to use them, has seen proper coffee culture take over our kitchens and dining rooms, as well as our high streets. If you're serious about good coffee, then you need an able and equipped coffee machine help you to achieve the ideal cuppa for you. The simplest of coffee machines is the cafetiere, or French press. Add the desired amount of your favourite coffee to the bottom of the Pyrex glass cafetiere, stir it, leave it for a minute or two, and then plunge it, to make two or three cups of coffee. The Pyrex glass will help maintain some warmth, although you may need a coffee hot plate if you intend to drink the pot over the space of a couple of hours. 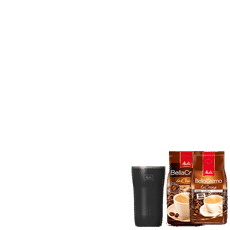 The cafetiere is quick and convenient, and the size of the pot means that you can usually use this type of device to make multiple cups of coffee in a single go, without having to clean everything up and go through the whole process again. Choose the size of press you want, according to the number of cups you would usually make in one go. You can make a cup each for several people, or you can enjoy refills until the jug goes empty. The cafetiere is inexpensive and it enables you to choose from a massive range of coffees to get the flavour you desire. Bean to cup coffee machines are the ultimate in proper coffee makers. They are more expensive than the cafetiere but they allow you to use fresh coffee beans, therefore enhancing and improving the flavour, and they tend to be used to make espressos, which are the basis of a huge range of different types of cup of coffee. You will usually need to clear the bean to cup coffee machine filter out after each use, but Melitta has created machines that are easy to maintain so this won't be a hassle. 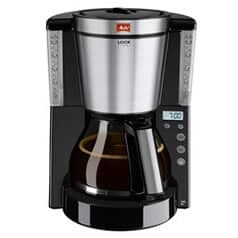 Bean to cup coffee machines like the Barista T Smart, from Melitta, often have advanced features that are designed to further improve your coffee making and coffee drinking experience. For example, there are several settings that let you choose the strength of your brew, from extra mild to extra strong. The grinder even has 5 settings, so that you can opt for a fine or a coarse grind, which matters when you make different types of coffee. The water tank will hold 1.8L of water, which is roughly enough to make around 8 cups of cappuccino without having to keep refilling the machine. The Barista even has automatic cleaning and descaling functions. Set them going, according to the instructions, and it means that you won't have to manually clean the coffee maker after every single use. The milk frother allows you to warm milk, and froth it, to make the perfect head for your cappuccino. Not only is the Barista great at making superb tasting cups of coffee, of many different varieties, but it is easy to clean, easy to maintain, and easy to use. The filter coffee machine is arguably the most basic of coffee machines, but it is where Melitta first developed its reputation, Company founder, Melitta Bentz, received a patent for a filter top device with a paper filter. The same design is still used to this day, not only by the Melitta company, but by a host of other manufacturers and producers too. A filter coffee machine does not afford you the same options when it comes to making cappuccinos, espressos, and other advanced coffee drinks, but it does enable you to make a pot of coffee at a time and it lets you and your guests choose how you want your drink. The filter coffee machine is also less expensive than an espresso or bean to cup machine, and despite the affordability of Melitta coffee machines, you can still enjoy great looks and a high-quality drink. Decide whether you want a filter coffee machine or a bean to cup coffee machine, opt for the desired colour to match your kitchen design or the colours and styles of your place setting. Decide whether you need extra features, and you can ensure that you get the right coffee machine for your kitchen. 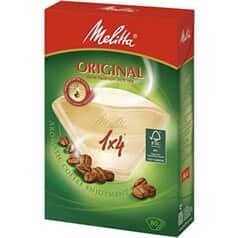 Melitta not only makes the coffee machines and cafetieres for preparing your brew in. They also create accessories like paper or porcelain filters, thermal mugs, and even a manual water kettle. Choose from a huge array of coffee style glasses. Whether you prefer espresso to cappuccino and macchiato to flat whites, you can buy the accessories and the coffee machine to get the best results. ECookShop is the official website of Dawson's Department Store. We have a large selection of coffee machines, including those from the well respected and well known German manufacturer, Melitta. We stock both filter coffee machines and bean to cup machines, and we can also supply you with filters, cups, mugs, and many other items for your coffee production. If you have any questions about the products that we sell on ECookShop, give us a call and speak to one of the friendly team. Alternatively, you can all in to Dawson's Department Store, where you will be able to see all the items for home and garden that we sell. Or, if you buy online today and spend over �50, you can enjoy free delivery to your mainland UK address.